All-Star Taylor Motter led the Bulls to a late night victory over in Norfolk with all the Bulls’ RBI. We have not written all that much about young Mr. Motter this year, but it has been fun to look around the field to see where he’s playing each evening. Mostly right field, but just about everywhere else over the course of this season. Last night was his chance to shine at bat (as he’s done several times). He got his first RBI with a ground out that scored Boog Powell from third. He got two more in the 8th with a home run with Tim Beckham on first. And his last two in the 9th with a double that scored Ryan Brett and Boog Powell. We are noticing, as the Bulls surely are, that young Boog Powell does his job as leadoff man. His On Base Percentage is a very nice .409 since coming up from Montgomery. He scored 2 of the runs last night. Also, Tim Beckham has been looking awfully good since joining the Bulls, 3 doubles out of his 5 hits, 2 walks, and an OPS of 1.266. That will drift downward over time, but still nice to see. Matt Andriese is back with the Bulls and he had his 5th start. Here’s hoping he hangs around for a while. By the way, in keeping with my skepticism regarding intentional walks, the Tides tried it last night and it didn’t work for them. You could say that it lost the game for them. In the 9th with one out, Ryan Brett had singled and stolen second base. The Tides gave an intentional walk to catcher Bobby Wilson (batting average .154) to set up a double play. Boog Powell obligingly hit a grounder, however not enough to set up the double play. Brett ended up on third base and Boog Powell was on first. Tim Beckham drew a walk (note: the Tim Beckham we used to know probably would have been swinging, no matter what), loading the bases and setting up Taylor Motter’s game-winning two out double that scored the runners from third and second. 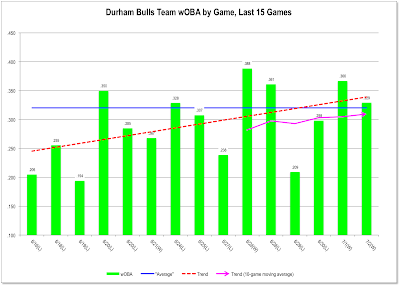 Bulls hitting has been on the upswing. 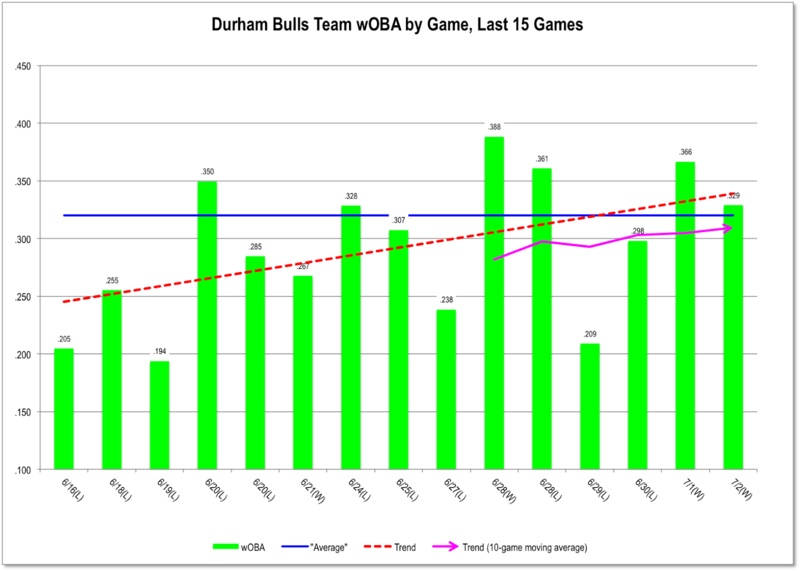 This chart shows the team Weighted On-Base Average (wOBA) on a game-by-game basis for the last 15 games. Nice little upwards trend these last couple of days.